Regular readers will know that in 2010-2011 I spent four months as a visiting artist in East Timor, or Timor-Leste, as it is officially known. East Timor is a fascinating, compelling, challenging place to be – each of these in turn! I loved my time there and I learned much about myself as a musician, and about music in other cultures. East Timor’s traditional music is rich and multi-layered but at the time of my visit there were very few publications or recordings that I could access to familiarise myself with it. East Timor’s complex and often violent recent history of colonisation by Portugal (until 1974) and military occupation by Indonesia (1975-1999), has meant that its musical culture was at first undermined and later forbidden, seen as an expression of resistance and nationalism. It was therefore not well-documented in formal, Western ways, but of course knowledge was retained and transmitted aurally and orally. Therefore, the recent publication of Lian Husi Klamar (Sounds of the Soul: The traditional music of East Timor), a book with accompanying CD/DVD, is extremely significant, as it is the first comprehensive published archive of this rich musical culture. The author, musician and researcher Ros Dunlop (a colleague and friend) spent years visiting Timor, travelling to remote and almost-inaccesible parts of the country to talk with elders, meet musicians and record their performances. One of the beautiful and particularly noteworthy things about this project is collaborative involvement of many Timorese musicians and artists. These people were acutely aware of the importance of creating an archive of their musical heritage. Younger Timorese – including artists from the Arte Moris art school in Dili – helped in all sorts of ways with the project, translating, driving and guiding, advising, filming and organising the recording sessions. The book has been published in both English and Tetun (the national language of East Timor), and will be highly valued in a country where there are few books published in their own language. I’m proud to say that some of my photographs and interactions with traditional instruments have found their way into Ros’s book – Ros was determined to include as many examples as she could find. 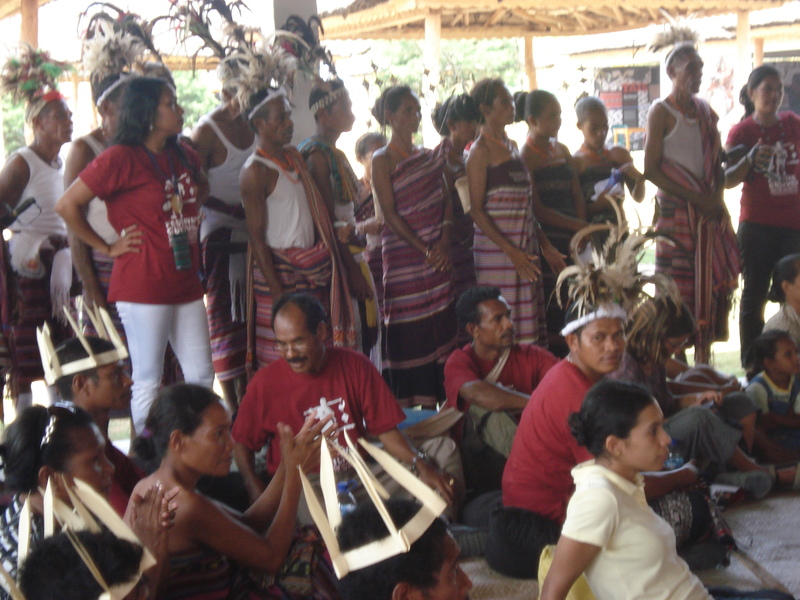 There are many national groups and family clans in East Timor who each have their own traditions, and Ros followed up every lead she could. It was a huge project that spanned many years, and now the book and CD/DVD of the archive, Lian Husi Klamar (Sounds of the Soul: The traditional music of East Timor) is available for purchase (here). There’s a great interview with Ros Dunlop published here if you would like to know more about the project. Towards the end of the book, Ros describes a children’s song in an ancient form of the Fataluku language (spoken in the town of Lospalos where I was based during my residency) which ends with the children sitting in a circle and pulling each other’s ears. I realised I had footage of some Lospalos children teaching an ear-pulling song to my partner Tony. This may or may not be the same song Tupukur Ulute that is described in the book, but it may well be related in some way. Their performance of the song in this little clip is a bit rowdy, a bit chaotic – definitely authentic! We walked around the site in small groups, deciding where we’d most like to create a piece for performance. We wrote riddles and clues to put in a program to help the audience find our sites and performances. We wrote music that used the environment in some way – its physical attributes and space, or ambient sounds that could become part of our composition. One group positioned themselves on the side of a hill and decided to run up the hill several times throughout each of their performances. (They were very tired by the end). After we’d finished composing, we did a dress rehearsal, walking to each of the sites in turn and seeing the other groups’ performances. At 4.30pm the performances began. Parents and friends came along; we also invited families who were in the playground next door to ArtPlay at the time we were about to start. The Hidden Music children spent a few minutes going up to adults and children, describing the project, and inviting them to join in the musical hide-and-seek. Quite a lot of people decided to do this. 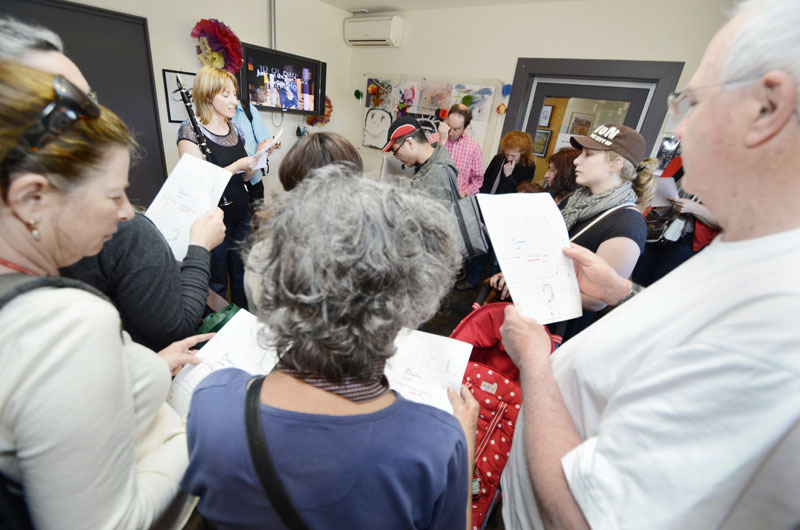 They gathered in the foyer at ArtPlay and heard an explanation of how the performances would work. Then the ‘finding’ began. Younger children raced around, excited to discover the performances as quickly as possible. There were four spaces altogether – two inside (on a staircase, and inside two ‘cubby houses’) and two outside (in an empty shipping container that happened to be available, and in the small ‘forest’ behind ArtPlay). Musically, the pieces were very varied. 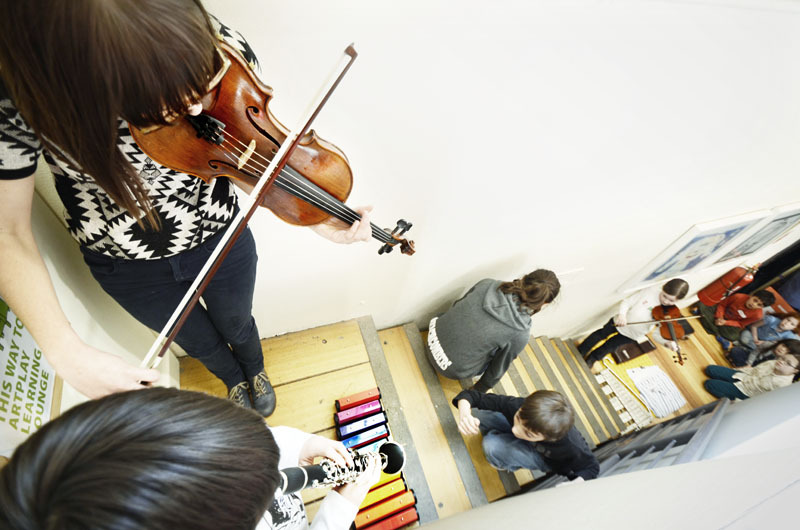 The piece created on the staircase used the steps up and down as a kind of physical graphic score. One child would walk while their partner would play the notes assigned to each step they touched. 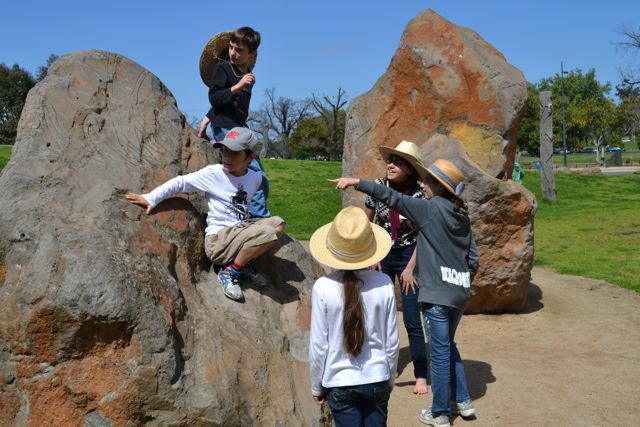 The cubby house pieces played with antiphonal effects and distance, and the group in the forest created a multi-section piece that used a gong to signal the start of each section (which always involved them running further up the hill in order to perform it). 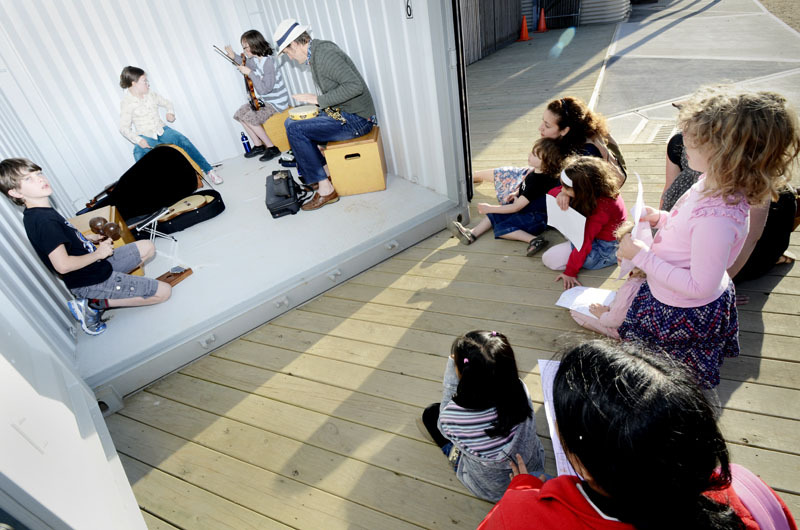 The piece in the shipping container included a very loud, thunderous section that required the players to bash the sides of the container with their hands, feet, elbows – while playing their instruments! Very dexterous, and the children’s suggestion. Each group performed their music 4-6 times, and with each repeat performance, their confidence and performance poise grew. By the end, they were adding things, changing things, improvising new sections – all without discussion or planning. They were so in sync and comfortable with each other, the music began to develop new turns, with the performers hearing, responding and intuiting where it was going. This is one of the great gifts of this kind of performance project. 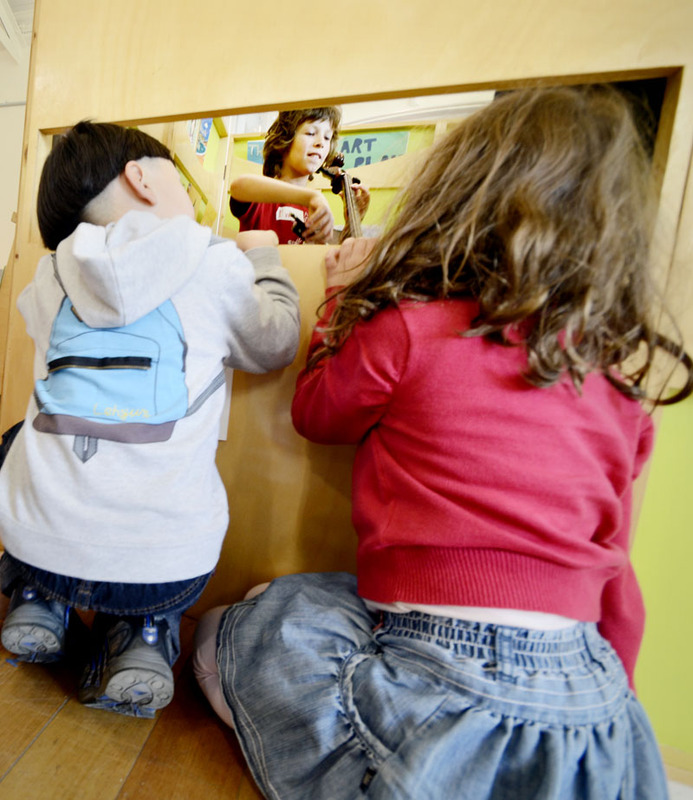 Children don’t often get to do multiple performances of the same material in quick succession, but when they do, they can make tremendous leaps of musical understanding and confidence. 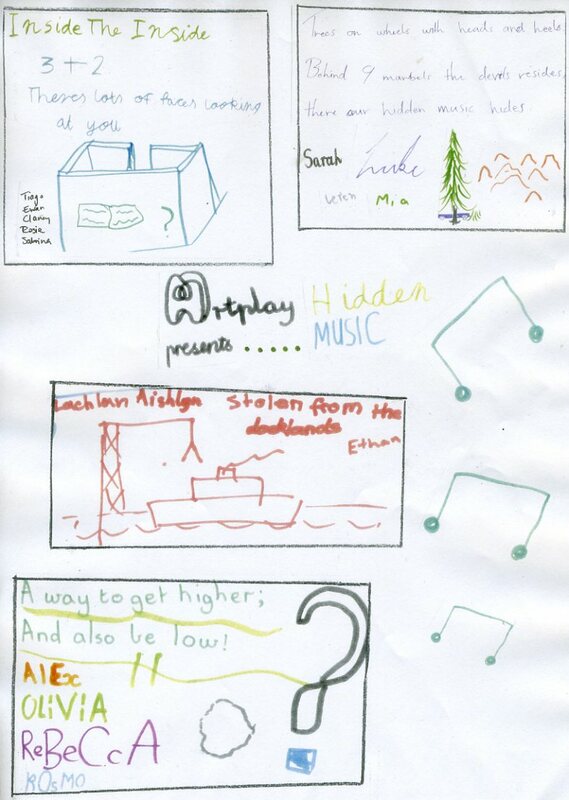 Hidden Music was such a joyous project! At the end of one of the performances, one child turned to the musician working with him and said, beaming, “I’m just having the best time!” Later, the children talked about the things they’d learned, and what they’d particularly enjoyed. You can hear some of their comments, as well as those of members of the audience, in the video below. 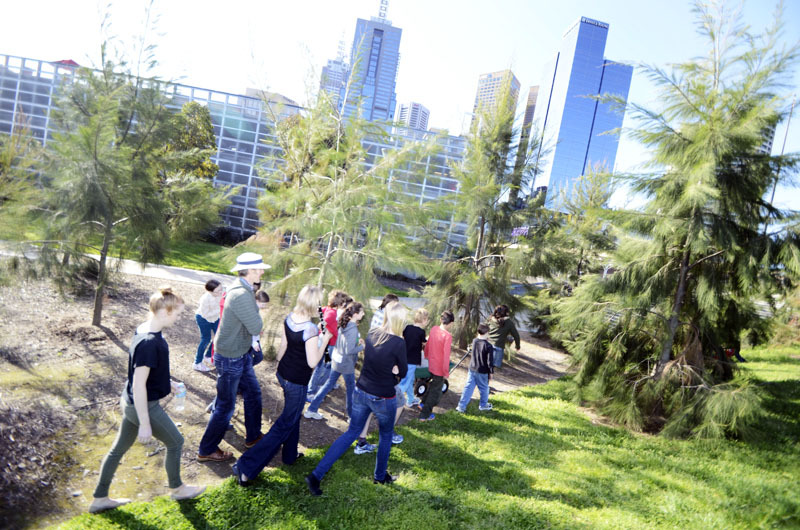 In 2013 Hidden Music will move on to the Arts Centre Melbourne, and in that enormous, iconic building with its many levels and corridors and corners and staircases I know we will find even more beautiful and unusual sites for performance. Photos in this blog post are by Melbourne photographer Charlie Sublet (www.charliesublet.com). 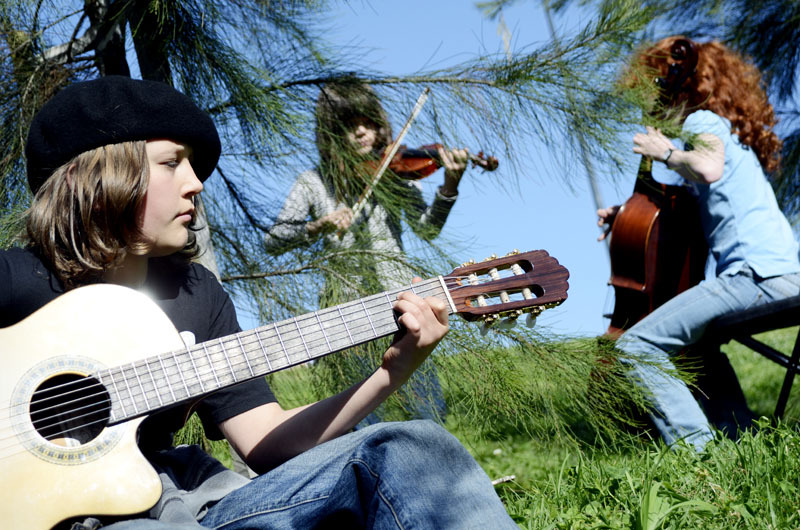 Hidden Music was funded by the City of Melbourne. Yesterday and today were the last days of the 2012 City Beats program, and all the children from the four disadvantaged schools we’ve worked with this year returned to ArtPlay to compose a final work with me and three Melbourne Symphony Orchestra musicians. In this year’s program we’ve been using the four classical elements (Earth, Fire, Water, and Air) to inspire our percussion and vocal compositions. In each project, I’ve introduced the children to a particular technique for developing original material, and particular instruments that suit the character of the element we are focusing on. We started with Earth in Term 1, and worked with very grounded grooves and riffs, using djembes and xylophones. In Term 2, we shifted the focus to Water, and the children explored very resonant instruments, such as orchestral chimes and tam-tams. We also experimented with water as a percussion instrument, pouring, slapping, splashing, and striking metal instruments like bells before submerging them slowly into water and hearing the pitch change. For Air, we introduced the children to harmonic whirlies, and wrote songs inspired by their stories of experiencing the air around them. Here is a clip of one such song – this song is a real ear-worm! But don’t let that put you off – press ‘play’ and listen as you read the rest of this article! The melody was created by listening for any fragments of tone patterns that emerged when several children played whirlies at the same time. You can also hear their 8-beat vocal patterns in the introduction. (Go here to hear other songs created using this process). 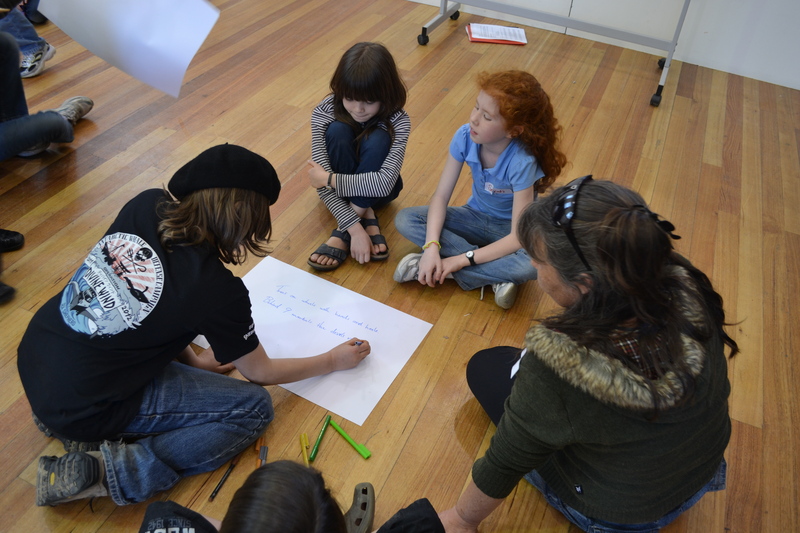 In this week’s Fire workshop, we created short stories about ‘fire’ and decided collaboratively what should happen in the beginning, the middle and the end of the narrative. The children then divided into 3 groups, and created a short riff, basing it on a sentence or phrase that summarised their part of the story. They then arranged these riffs into short pieces. We performed these compositions to each other, and then finished the 2-hour workshop with a spontaneous jam, bring back material from the 3 previous workshops. The beauty of the City Beats program is that the children come back every term, and we get to develop very solid relationships with them. We observe some beautiful learning journeys through the year – such as one girl, who in the first workshop was so self-conscious and resistant that she wouldn’t even say her own name during the warm-up activities. In today’s workshop she was a different person, completely relaxed, enthusiastic, contributing ideas, playing a range of instruments, and just having a great time. All the groups display a wonderful ease with creating their own music now, and are far more aware of the others in the group, many of them locking into grooves and harmonies with little assistance. City Beats is a program for disadvantaged and under-served schools where the children are unlikely to be able to access any extra-curricular music opportunities. We hope that it serves as a starting point or a pathway for those children who want to do more music – bringing them into the city (for many this is a rarity in itself), introducing them to ArtPlay, to me, and to the MSO, and giving them confidence in their musical skills. We tell them about other workshop opportunities or scholarships that are coming up, and hope that the City Beats experience encourages them to take the next step.